We got a call from a customer interested in trying to get her microfiber sofa back to its original condition since it was heavily soiled and had several spots all over the cushions and pillows. After inspecting and giving her the quote for the cleaning she agreed and we proceeded with the cleaning service. We told her we will do our best to try to remove all dirt and spots from the heavily soiled microfiber sofa, for some reason this type of fabric attracts a lot of dirt oily from the skin. 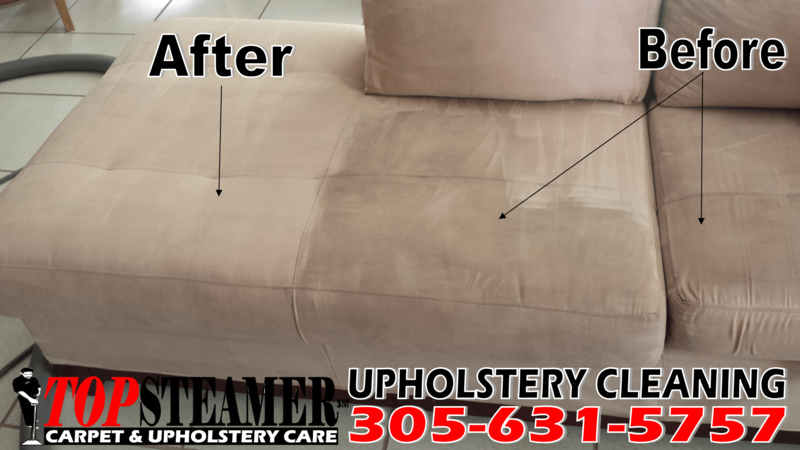 We started by applying a specialize neutral upholstery cleaning pre-spray to loosen the dirt and oily spots from the fabric, after dwell time we agitated all the microfiber sofa and finalize with a deep steam cleaning. As a final touch we like to go over the entire microfiber sofa with a dry microfiber rag prevent stains or spots to reappear and to accelerate the drying process. The results were amazing and customer was happy as her microfiber sectional sofa clean and back to its normal condition. A Curios Fact: The Carpet Cleaning Company Most Celebrities Use!